VMJ-3 was commissioned sometime in 1952 likely in February at same time as VMJ-1 was stood up in Korea. 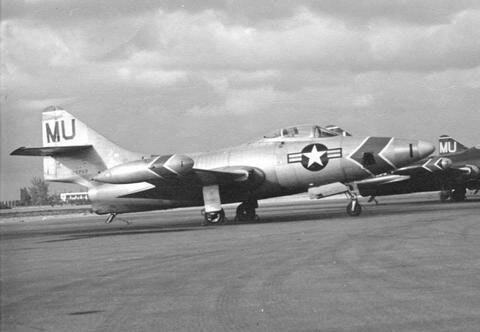 Its origins are unclear but it was stationed under the 3rd MAW at MCAS Miami in 1954 and moved to MCAS El Toro with the wing in the Summer of 1955 and on 1 December was merged with VMC-3 to become VMCJ-3. 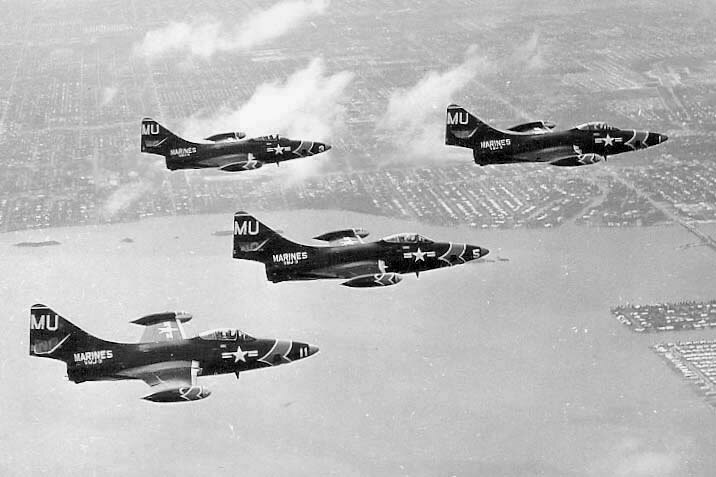 It was flying F9F-5P Panthers while at Miami under the tail code MU. "Panthers" stalk the skies above us, constantly "shooting upon the enemy's strongholds," bringing back information that in actual combat, might mean the difference between ultimate victory and defeat. True, there is no war to mar the beauty of the surrounding Miami area, nor a real enemy to be sought out by the photo-reconnaissance jets of VMJ-3. The pictures that are snapped sometimes 30,000 feet up don't reveal the position of hostile troops, and the mosaic maps don't set up any invasions, but they did once and they might again. This is the hard kernel of truth that keeps the pilots and ground crewmen of the photo squadron commanded by Maj. Ralph H. (Smoke) Spanjer steadily driving for perfection in technique and speed. The mission of VMJ-3 is the same of that of any reconnaissance patrol on land -- to bring back information. Unlike most combat troops, they do it unarmed. In the place of nose-cannons, they carry cameras - backed by courage. Many of the pilots of the local jet outfit saw action in Korea; some in WWII as well. The all admit readily that the weaponless flying required in a photo squadron doesn't exactly recruit new pilots in droves, nor do they discount the dangers found in combat. A man can lose his life taking pictures just as he can launching wing rockets when he's over enemy territory. The 3d MAW photo unit is a team in every sense of the word. In a squadron where speed and accuracy is essential, this trait is a necessity. A request for photo-reconnaissance may have a vital deadline. These are the "hot missions" that are the specialty of the Master Field based group. Lt. George W. Glauser set a speed record last year at an aerial demonstration here. Glauser took an aerial view of the grandstand, landed and passed on the exposed film, and 10 minutes and 15 seconds later, the finished print was presented to Brig. Gen. William G. Manley, CG, 3d MAW. Another demonstration of the squadron's proficiency and speed, was a special mission to take the picture of TV personality, Dave Garroway from a photo jet. 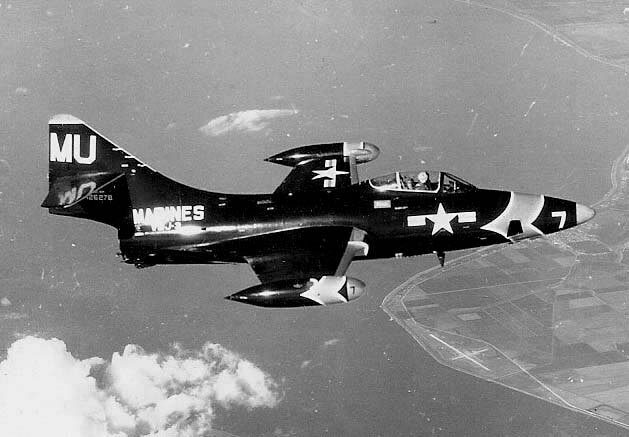 The jet, flown by Lt. Glauser, flew over Miami Beach where Garroway was broadcasting and got the picture. Before the TV show ended a Marine helicopter returned with the print, which was presented to Garroway. A photo request, after passing through channels to the photo officer, sets off a complete cycle, beginning and ending with the mapping and briefing department. They pass on a composite overlay or aerial view to the originator. Target site for the jet cameras may be any point in the United States. After the site is selected, members of the mapping crew prepare the necessary information and charts, figure the weather and time elements. 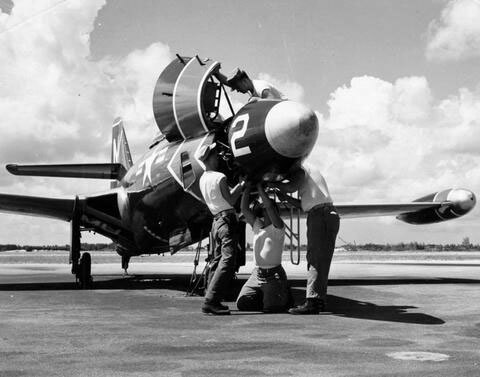 Following a briefing of the pilots, the installation crew goes into action setting up the F9F-5 Jets with the prescribed cameras, and, at the designated points in their tight time schedule, the photo planes are airborne. Armed with a special type camera (depending on conditions and tactical purposes) the pilot begins plotting his flight, making the necessary adjustments in his procedure pattern. Generally, the F9Fs are equipped with either the 6-, 12-, or 24 inch lens cameras, anyone of which is quite a bit larger than your Brownie. At times conditions demand a 36 inch lens for high level flying. Fuel consumption is all-important. The pilot must decide his best speed and altitude to get the most out of his fuel supply. Needless to say, you don't fly over the hostile area in combat more than once if you can help it. A combat-wise pilot will fly the same pattern he intends to fly over the target, once or twice before he ever gets there. Although many times an enemy battery won't expose their position for one aircraft, it can't be counted on. On target, sometimes as low as 300 feet, the sensitive camera can "get the picture" straight down, obliquely, black and white or in color -- all at near-sonic speeds. As the airborne photographers touch down on the home runway, the installations men are standing by to unload the camera, set up the film for developing processes and, if necessary, load another camera for the next mission, all in a matter of minutes. The main job of the installation crew of VMJ-3, as seen by TSgt. H.J. Hennigar, NCOIC of the crew, is to ".....keep the (the cameras) working, and find out why if they don't." This is a more important function of the squadron than it might seem. If a camera or film pack fails to operate properly, the flight gets negative results. This is not only costly to the overall combat mission, but the pilot may have risked his life to take the pictures. On the flight link, plane captains, crews, and photographic technicians of the squadron constantly check the cameras to insure correct operation. Before a camera is loaded, it is "checked out" by two crewmen. The exposed film goes from the installation section to the squadron lab. Here it's processed on special rollers that keep the continuous strips of film agitated in the processing solutions. "Two hundred exposures on one roll is an average job for us." said Pfc W.D. West, developer. Still another phase of the operation is the drying process. Like any other drying process, the cloth-belt roller type drying machine is employed. Instead of dropping the dried prints into a basket, it spews the dried roll out like a typewriter ribbon coming unwound. "It sure keeps you busy when it starts coming out". admitted Pfc Franklin D. Armstrong, dryer. At the end of the technical processes, the results are given to the mapping department, where it all began. The photographic procedure that the squadron goes through has been often referred to as the latest thing in map-making. However, photo-maps have that degree of accuracy that could never be captured by a draftsman. Maj Robert T. Bell, Operations Officer of the squadron in describing the difference between a fighter-interceptor pilot and a photo pilot, said, "A fighter pilot is an artist who flies by "touch", a photo pilot is a craftsman, whose every action is deliberate and methodical." Much of the mission-success enjoyed by the squadron is directly traceable to their well developed training program. Most of the photographers are well versed in all phases of aerial work, and have the experience of application from Korea behind them. "Roughly two-thirds of the staff NCO's in this squadron are veterans of the Korean conflict." estimated MSgt Geo E. Thomas NCOIC photo office. This is an asset in getting the principles of operation over to the younger, less experienced men. We know how the mission must function to be successful, making it easier to teach to others. New pilots of VMJ-3 have much the same advantage, as many of the pilot-instructors are also veterans of combat. Part of the fledgling "jet jockey's" training includes about 45 hours of photo schooling. It is felt by the command that a man who comprehends all aspects of the mission, no matter how technical, will perform his own job more competently. The flight syllabus maintained by VMJ-3 is extensive and complete. Following familiarization of the pilot with his F9F, which includes "checking out the position of the switches in the cockpit and the capabilities of the aircraft, they must pass a thorough examination of the plane. 100 percent is the only passing score. Maj Spanjer said of his squadron, which he has commanded for the past three months, "....VMJ-3 seems determined to be the best squadron of its kind. It is that sort of spirit which enables a photographic squadron to perform its vital role in modern combat.